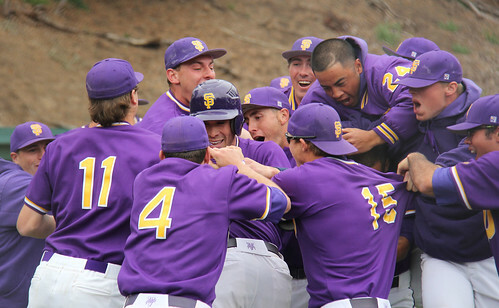 SF State Gators baseball team celebrates a victory against Sonoma State Seawolves on Saturday at the Maloney Field. Gators won 6-5. Photo by Mihail Matikov. The SF State Gators earned another late win beating Sonoma State 6-5 Saturday. An error plated Mark Lindsay for the decisive run in the only game of the non-conference series against the defending-champion Seawolves at Maloney Field. The win improves the team’s record to 10-8 on the season with a conference record of 7-5, tied second in the California Collegiate Athletic Association. Though both Sonoma State and SF State are CCAA teams, their matchup was not counted as a conference game. The Seawolves are now 13-8, with an 11-2 conference mark. The Gators failed to capitalize on early opportunities, going 0-for-3 with runners in scoring positions before gaining four runs in the bottom of the sixth inning. SF State gained a 4-3 lead after Sonoma State plated three runs on two hits, a walk, and a fielder’s choice in their half of the fourth. The score would stay the same until the Seawolves scored a run in the seventh and another in the ninth, both of which were against pitcher Branden Petrangelo who allowed four hits in two innings. Pitcher Peter Reyes replaced Petrangelo and allowed no hits, striking out one of the two batters he faced. The Gators continued their season-long trend of earning late victories, as the team would rally yet again in the final inning. Trailing 5-4, Almaraz began the comeback effort by hitting a single on reliever Michael Garber’s 2-1 pitch. After advancing to second on A.J. Pianto’s sacrifice, Almarez scored on Lindsay’s double to left center, tying the game at 5-5. From there, the Seawolves struggled against Gator offense. With two outs, Garber hit Gator Devon King in the shoulder, advancing him to first. With Gator runners on first and second bases, pinch hitter Matt Quintero came up to bat. But Quintero would remain a spectator as Sonoma State’s Joel Thys attempted to pick off Lindsay at second. Thys’s overthrow to second base allowed Lindsay to score on a close call at home plate, giving the Gators the 6-5 victory. Lindsay led all batters with three hits in five at-bats, scoring two runs and driving in Almarez for the game-tying run. He is second on the team with a .338 batting average, behind only Quintero’s .341 mark. Reyes lowered his season earned run average to 1.38, which is a team-best. By earning the victory, he improved his record to 4-1. Gators’ starting pitcher Matt Cummins left after just one inning of work because of arm pain, giving up a hit and walking two batters before leaving. Eric Watts replaced him, giving up the Seawolves’ first three runs in the fourth inning. Despite struggling in some respects, Lindsay emphasizes that an ugly win is still a win.